I live near Cape Cod, Massachusetts. It's a wonderful place that I usually visit multiple times throughout the year. This year I only visited once. I'm going to have to correct that error. I miss my wild Atlantic views, investigating the various denizens of tide pools, and watching seals surf the waves. Sigh. 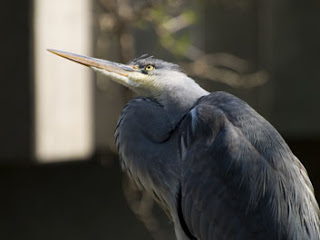 Sea birds are plentiful all year round on this barrier island system. I did spend two days on the Cape in August. Now, if you've never been to Cape Cod you should know that during July and August the traffic is terrible and getting over either bridge that will get you across the Cape Cod Canal (the Sagamore or Bourne) may be the single most significant test of patience you will ever face in your life. I tend to prefer the Cape in Spring, Autumn and Winter because of this. But even at the height of summer tourist season it is a great place to visit. I highly recommend the various Mass Audubon properties like Wellfleet Bay Wildlife Sactuary, Long Pasture Wildlife Sanctuary, hiking the Great Island Trail in Wellfleet, Skaket Beach, exploring the sand dunes near Provincetown, and the Cape Cod National Seashore. The first day I was there friends and I went to Long Pond in Harwich to float in the water and escape heat of the 90 degree weather we were having. Why go to a fresh water lake in the middle of some of the most beautiful beaches in New England? The water temperature is warmer, we could find parking, and...well...there are no sharks to worry about. 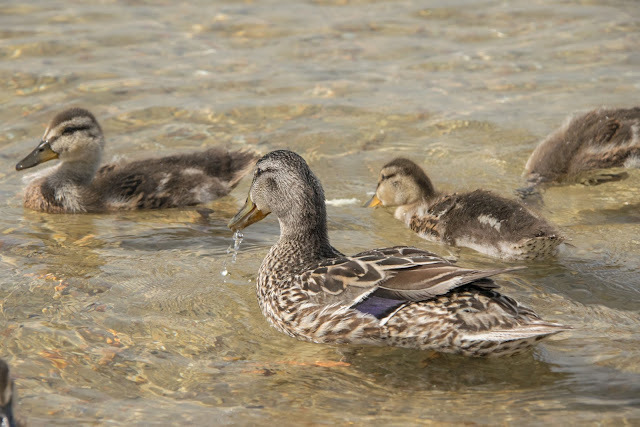 You do have to share the beach with some friendly Mallards though. 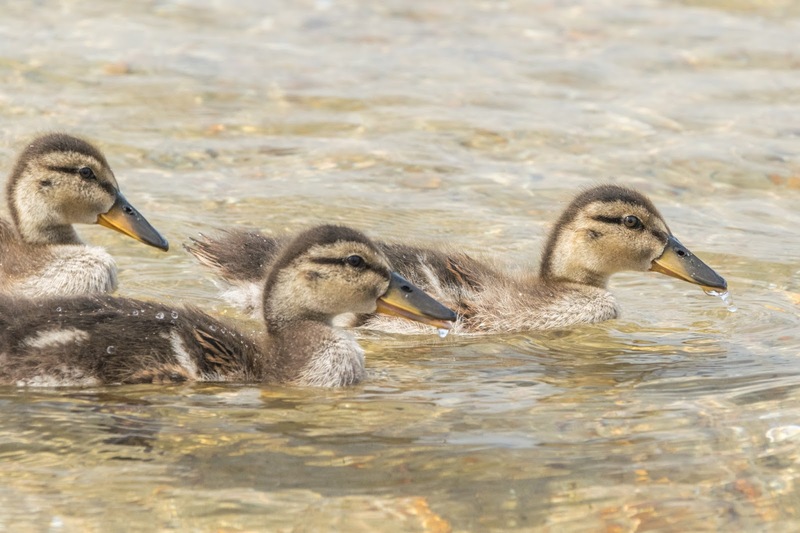 Baby Mallards on a mission and swimming in formation. The next day found us out on the water in search of seals. 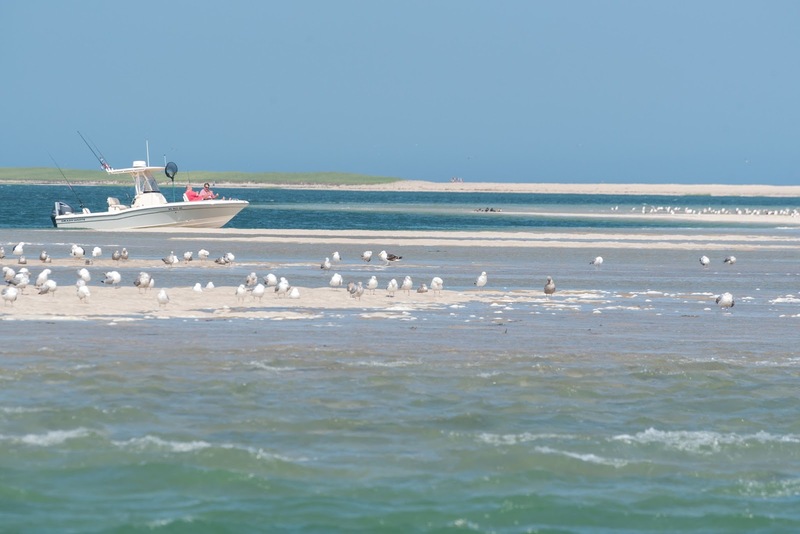 This is my third trip with Monomoy Island Excursions. They take you through Wychmere Harbor in Harwich Port to see osprey and then out to the waters off Monomoy Island, a barrier island south of Chatham, Massachusetts. 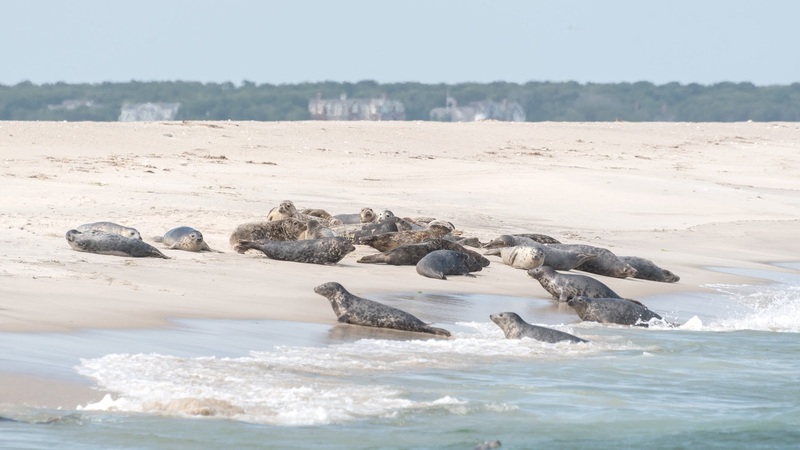 Monomoy is also a national wildlife refuge. Most of the time you'll end up staying within the confines of Nantucket Harbor but if the tide is right the boat can slip through a gap in the barrier island system and take you into the Atlantic side of Monomoy Island. 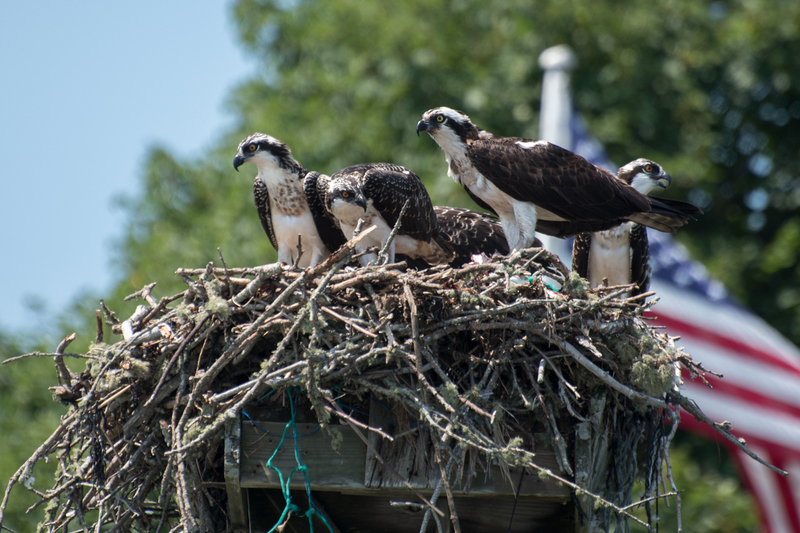 The ospreys of Wychmere Harbor had four babies this year. One of the parents is in the foreground and has just dropped off a fresh fish to be enjoyed by all. This is the other parent of the four young ospreys demonstrating...um...the force at which previous meals can be evacuated from its system. Ahem. The Atlantic side is wilder in terms of surf but you see just as many seals. 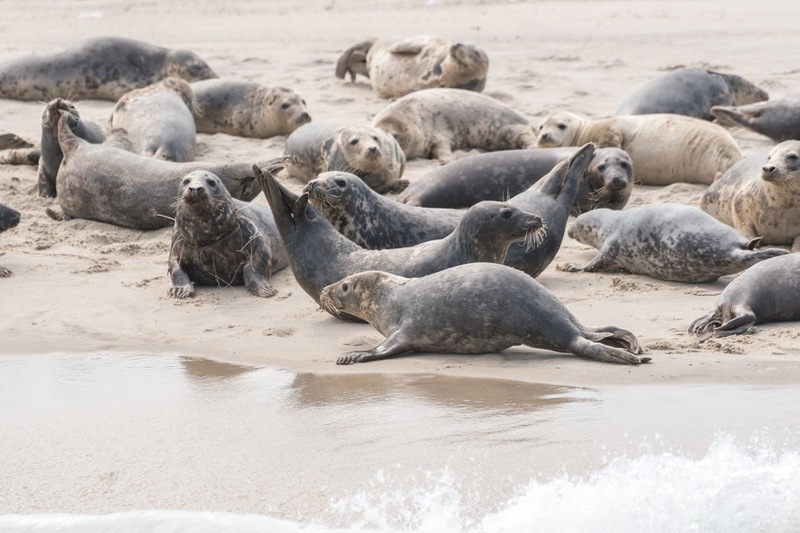 There were many young seals at this time, most congregated either just off shore or playing in a whirlpool of waves a bit farther out. Mostly gray seals here. The two in the middle seem to be having a bit of a discussion. Actually the seals were making the most amazingly eerie sound at this time, calling like selkies to each other across the sandbar. 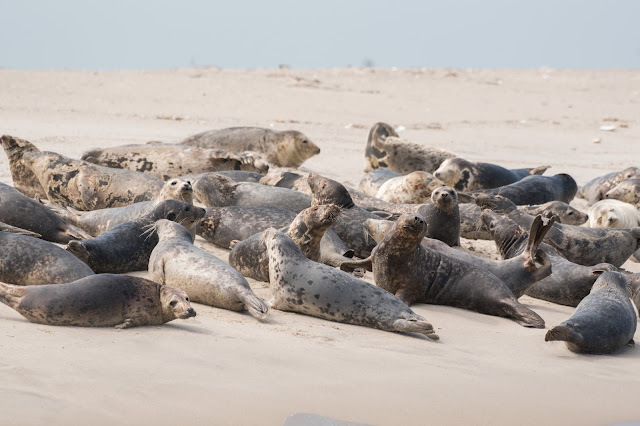 Most of the seals you will see are Harbor and Gray seals. 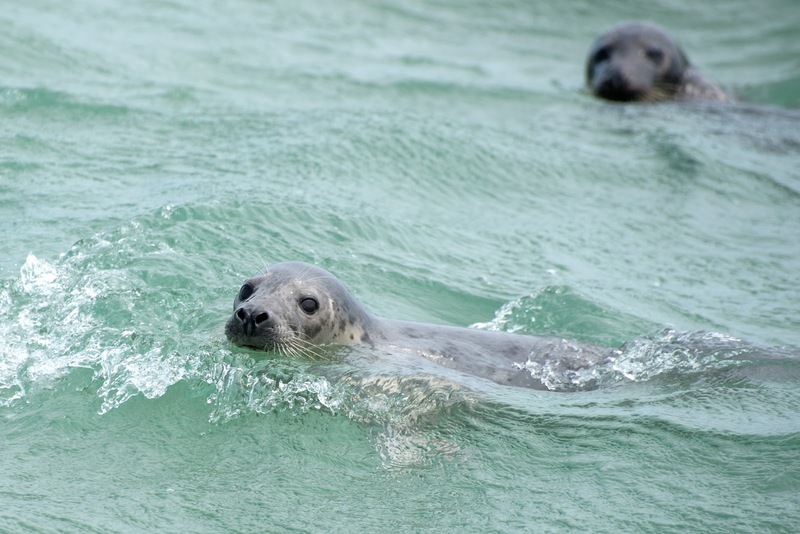 You can tell Gray seals by their long faces. Harbor seals have much shorter, more doglike faces. The seals also bring special guests with them -- Great White Sharks. I have yet to see a shark in person but I'm hoping someday I will...from a good distance. Young gray seal coming out of the surf. Some of the seals demonstrating how flexible they are. But really, there is something very sad here. 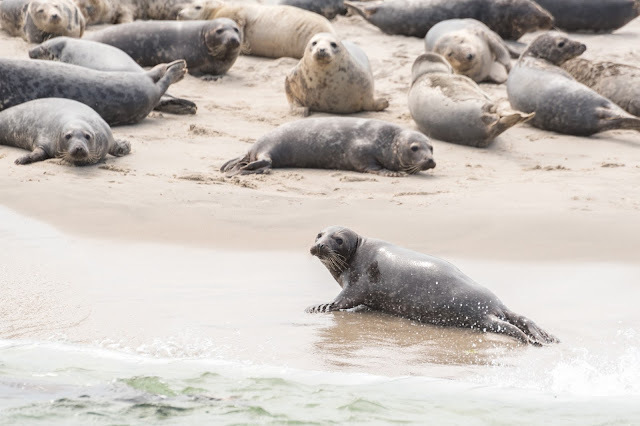 The seal on the left has some sort of fishing net wrapped around its neck and it looks like its skin is trying to grow over it. A young gray seal investigating our boat. 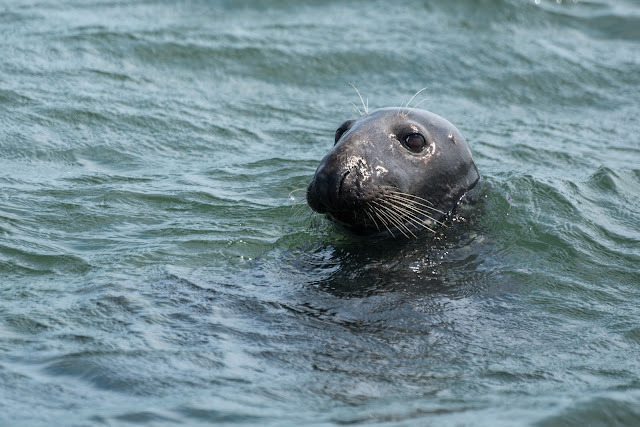 This is an adult gray seal. What they don't tell you about seal watching is that its the seals that will watch you. loved the seal pics! I used to live in Eastham on First Encounter beach...have you ever shot there?.. when are you off to Vancouver Isle? Yes, I love that beach. I've pretty much been on every beach on the Cape. I was in Seattle and in Vancouver Island in September. Then I was in Arizona earlier this month and I'll be back in Utah and also Nevada in a couple of weeks. This basically means I'm never catching up on my blog and editing photos!